Immigration reform and Boehner: Should U.S. policy be more like Qatar’s or Sweden’s? Is the U.S. More Like Sweden or Qatar? Before we can reform immigration, that’s what we need to decide. 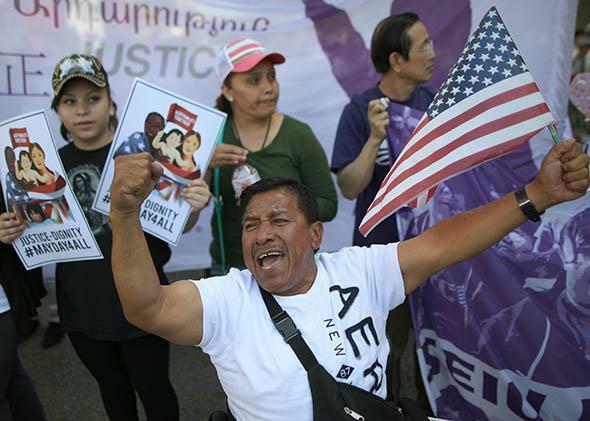 A man chants during an immigration rally on May 1, 2014, in Los Angeles. Yet again, House Speaker John Boehner is in trouble with conservative lawmakers. This time it’s because he wisecracked at a Rotary Club luncheon about his fellow House Republicans’ failure to take action on immigration reform. “Here’s the attitude: ‘Oooooooh, don’t make me do this! Ooooh, this is too hard!’ ” Boehner said to the assembled Rotarians. And with that, Boehner sent the message that like virtually all elite Republicans, from Wall Street donors to policy wonks, he believes that comprehensive immigration reform is a no-brainer and that the conservatives who’ve been fighting against it are either cowards who don’t have the guts to stand up to their constituents or troglodytes too thick-headed to understand that when Mark Zuckerberg, Mike Bloomberg, and the Wall Street Journal editorial page all agree on something, they can’t be wrong. If nothing else, being an immigration reform cheerleader is a clear way for conservatives like Boehner to signal that they’re not unenlightened bigots, like those right-wingers from the sticks they so disdain. Supporting immigration reform is also cheap from a budgeting perspective, since welcoming large numbers of less-skilled workers appears to cost taxpayers very little if you deny them access to subsidized health insurance, food stamps, and other anti-poverty programs, an approach favored by virtually all pro-immigration conservatives. But there’s a small problem with this line of thinking. The comprehensive immigration reform proposals that have won bipartisan support, like the Senate immigration bill backed by the “Gang of Eight,” are heavily tilted toward the short-term interests of big business while not being tilted enough toward the interests of law-abiding immigrants hoping to enter the middle class. What we need is an immigration policy that will help rather than hinder our efforts to integrate the millions of struggling immigrants who already live and work in this country into the American mainstream and keep them from becoming a permanent underclass. The idea behind comprehensive immigration reform is that we ought to combine three separate things. The first and most politically contentious part is granting legal status of some kind to some share of the 11 million to 12 million unauthorized immigrants currently living in the United States. The second and least politically contentious part is welcoming a larger number of skilled professionals, entrepreneurs, scientists, and the like. The third and most underappreciated part is welcoming large numbers of less-skilled workers, whether through a guest-worker program or some other mechanism. Politically speaking, wrapping these three very different things in the same neat package makes a lot of sense. Comprehensive immigration reform unites high-tech companies looking for cheap software developers; agribusiness companies looking for cheap agricultural laborers; and ordinary voters, many of whom are immigrants themselves, who recoil at the idea of mass deportations that could, among other things, break up families and communities. Think of it as mutual hostage-taking. No, GoogleAppleFacebook, you can’t hire more brainiacs from Belgium unless we grant legal status to the unauthorized. No, DREAMers who want to stay in America, you don’t have the political muscle to get legal status without also getting the lettuce lobby on board. The other question, however, is whether this neat little package makes any logical sense. And the answer is that no, it does not. To understand the perversity of the American immigration debate, it helps to zoom out and consider how immigration policies work around the world. Crudely speaking, you can separate countries that attract and (to at least some degree) actually welcome immigrants into two camps: those that take the high road and those that take the low road. Some immigration advocates, like Lant Pritchett of the Harvard Kennedy School and the Center for Global Development, argue that the Gulf states are actually closer to getting immigration policy right than the Scandinavians. If we think of immigration policy as involving a quality-versus-quantity trade-off, Pritchett, who sees immigration from poor countries to rich countries as an important strategy for fighting global poverty, chooses quantity. If more Bengalis, Beninese, and Bhutanese are allowed to work in rich countries, they’ll be able to send more in remittances to their families back home, which in turn will help lift more families out of poverty. This is true even if these migrant workers aren’t granted many freedoms, if they’re paid far less than local workers, and if they’re only allowed in the country for a limited period of time. Indeed, from a poverty-fighting perspective, you’d actually want migrant workers to turn over pretty often: Each time one batch goes home, another batch could come to Doha or Dubai to earn money and send it back to their native countries. This churn is a great way to spread the wealth. So what’s not to like about the low-road strategy? Well, a lot depends on the kind of society you want to have. The Gulf states have no intention of integrating poor migrant workers into their societies. They want them to come, work for a while, go home, and leave it at that. The Scandinavians, in contrast, spend a heck of a lot of money to see to it that migrants can be full participants in society. They don’t always do a great job, but they certainly try. And they try because they reject the idea of a two-tiered society, in which privileged natives live cheek-by-jowl with migrants who have no hope of living alongside them as equals. Perhaps the Scandinavians are just naive. If these migrants weren’t living alongside them, they’d still be living somewhere, and they’d almost certainly be a lot worse off. Other views, however, are that migration can never be as good a solution for fighting global poverty as improving governance in poor countries and that all countries, including rich countries, have the right to pursue their vision of the good society—including one in which you accept a small number of migrants and treat them extremely well. Should the United States take the high road or the low road? Right now, we’re doing a weird mix of both. For example, as Neeraj Kaushal, an economist at Columbia University, has observed, the incidence of food insecurity in the United States is unusually high for a rich country, and this is largely because of food insecurity among immigrant families who aren’t eligible for food stamps. The idea behind denying immigrant families food stamps is straightforward. Immigrants chose to come here, so it’s up to them to feed themselves. It’s an idea that resonates with pro-immigration conservatives and libertarians, who celebrate immigrants for their pluck and determination. If anything, denying immigrants access to social programs was their way of convincing their conservative allies that immigrants are not in fact freeloaders and that we should welcome more of them. When it comes to quality versus quantity, the pro-immigration right wants us to be a bit more like Qatar and a bit less like Norway. Yet the trouble is that immigrant families have children, and those children will, chances are, grow up to become American workers. And recent work by the economists Hilary Hoynes, Diane Whitmore Schanzenbach, and Douglas Almond suggests that when poor children have access to food stamps, they grow up to be healthier, more economically self-sufficient adults. Countries like Qatar solve this problem by making it difficult if not impossible for migrants to form families and by booting them out of the country if they become a burden. We Americans are not quite hard-nosed enough to really see the low-road strategy through. So we wind up living with the consequences of our stinginess when the children of poor immigrants struggle to climb the economic ladder as adults. So here is my immigration proposal for Speaker Boehner or for anyone who wants it. Let’s face the fact that we’re going to grant legal status to most of the unauthorized immigrants who currently live in this country. Then let’s face the fact that granting legal status to this population means taking moral responsibility for its members as members of the broader American community. The unauthorized immigrant population is extremely, extremely poor. In 2011, 51 percent of unauthorized immigrant children lived in households below the poverty line, and 78 percent lived in households below 200 percent of the poverty line. Even under a best-case scenario, granting members of the unauthorized immigrant population legal status won’t vault them into the middle class. Actually integrating these women and men and their children into the American mainstream will be an expensive, arduous process that will take decades. We need to be sure that future immigration does not reduce the wages of these workers by subjecting them to competition from workers with very similar skills. Instead, we should welcome skilled immigrants who will bid up the wages of less-skilled workers and a small number of less-skilled immigrants we intend to treat humanely and with respect, fully recognizing that their children will be as American as our own. In short, let’s take the high road.